Berth: Head to a white light house. 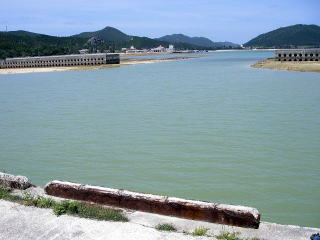 Then, passing a green pole standing at the entrance of the port at your left, proceed the right side of the white light house. The approach route is narrow. Once you are close to the light house, you will find the ferry pier. You can moor in the right side of the ferry pier. As there were only 3 local boats in the innermost right side, the other area was wide open. You can put your boat along-side though, when the south wind comes in, the wave comes in straight. You should be required to anchor. From the night of my arrival, a depression came close. The weather forecast said 20m/s strong south wind and 4m wave height. As I rode at two anchors, I had thought my boat should be OK. But I was nervous through the night because the boat was tossed about by big waves. The wind changed from south to north in the afternoon, which forecasted strongest wind was 18m/s speed. I thought the north side mountain must protect me though, the north wind coming down along the mountain slope was very strong. But, the north wind made no wave in the port, even when there were 4m height waves in the open sea. 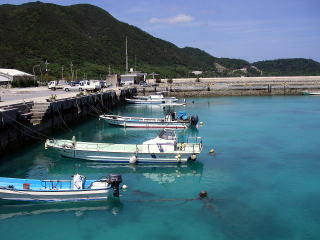 Matsumoto-san wrote that Iheyajima Port is the safest port of the four ports in Iheyajima. But, local people and long cruising yachtsman say Maedomari Port is better because of its open wide space. 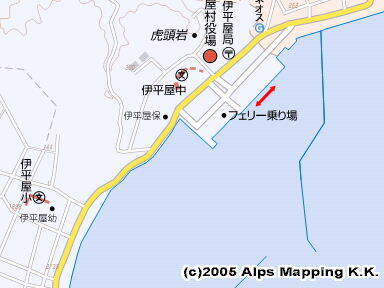 I am afraid few people move into Iheyajima Port. 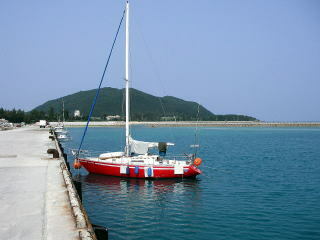 I myself visited Iheyajima Port walking from the land. The port looked safe and clean. I also found red and green buoys. However, if your boat tries to enter, you should get a routing advice beforehand. Gas stand is 7 minutes away. Toilets are in the ferry station and in the park in front of the ferry station. Coin laundry is in front of Maedomari Supermarket, 10 minutes away. “Nokyo” supermarket is 5 minutes away. Restaurants are in and around the ferry station.